Tourist guide books to Myanmar, like the Lonely Planet, tend to be either rude or condescending (or both!) about Myanmar Railway's ability to run trains. Well they shouldn't be. We rode two long distance services, Up 31 from Yangon to Bago and Up 11 Yangon to Mandalay, the latter a 15 hour journey, both ran to time throughout. By contrast our return to Yangon from Bagan on Yangon Airways was rather more chaotic. Originally departing at 09:15 it was re-timed, the day before, to 08:35 only to be delayed by 40 minutes leaving, you guessed it, at the original time of 09:15. That's not to say all is well with Myanmar Railways, it isn't. The railway authority needs to upgrade the mainlines, especially Yangon to Mandalay, with cwr and deeper ballast to reduce e2e journey times. For Yangon to Mandalay the objective is an end to end journey time of around 10 hours, some four hours faster than the best time today. Otherwise the railway will continue to lose out to buses on the (relatively) new expressway between the two cities. Myanmar has signed an agreement with Japan to fund the Yangon to Mandalay upgrade. So what are the trains like to ride? In a word, fun. Upper Class is very acceptable, 2+1 in reclining seats with oodles of legroom and a height adjustable footrest. There's no air conditioning but the windows open and with temperatures around 30C they remain open for most of the journey. Ceiling fans also help air circulation. By contrast Ordinary Class is 2+2 wooden or solid plastic seats and is often very crowded. Despite a pre-dawn until (after) dusk journey time here was no dining car on Up no.11, instead there was a never ending stream of vendors selling everything from beer to shirts, somewhat different to the range in a Virgin shop on a Pendolino! Some of the food is perfectly edible, some is unidentifiable and probably best avoided. But we had taken plenty of supplies with us and used the vendors for peelable fruit, bottled water and beer! The toilet in our Upper Class car was a European type, plenty of water but bring your own paper! And the train is serviced en-route, at Taungoo, where the tanks are replenished, so we never ran short of water. The ride is a bit rough at times and can be rather dusty too, especially if, like me, you spend much of the journey hanging out of the window. Maximum speed is no better than 90 kph. Yangon to Mandalay isn't one of the world's most scenic train rides. Much of it is across a flat plain of rice paddies. However you do get a glimpse of Myanmar's bizarre Pyongyang-ish new capital, Naypyitaw with eight lane highways devoid of all traffic, which the railway crosses on the level and an immense multi platform station in an oriental version of the architectural style I like to call Totalitarian Revival. Up no.11 pulled in to Mandalay on the dot of 21:00 having kept time throughout, it was a most enjoyable experience. Myanmar Railways has taken delivery of re-gauged (3'6" to metre) ex-Japan Railways DMUs, these are from the KiHa 40 series. 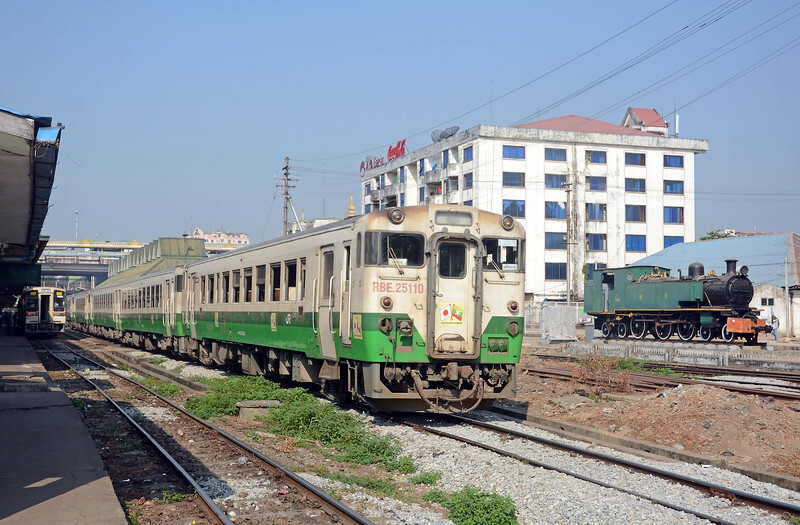 They're used on a variety of services, including Yangon's famed Circle Line. They still wear their Japanese livery, and display Japanese destinations although this set also wears Japan / Myanmar flags.